Fortress UAV is proud to be included in the Airborne Public Safety Association’s January-February 2019 issue of Air Beat Magazine! 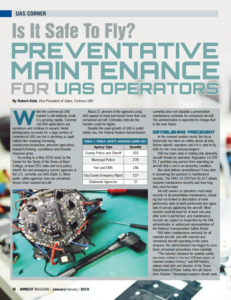 In the article Fortress UAV discusses drone preventative maintenance for UAS operators. They help to establish the precedent for preventative maintenance while looking at the manned aviation world, talk through recent FAA regulations, discuss why preventative maintenance is beneficial and most importantly – what to look for in a drone preventative maintenance service provider.